Basic Beekeeping: LESSON 68: What Do Bees Do During The Winter? & Candy Boards To The Rescue!! LESSON 68: What Do Bees Do During The Winter? & Candy Boards To The Rescue!! Merry Christmas from David & Sheri Burns at Long Lane Honey Bee Farms! It is always so rewarding to enter into the Christmas season. For us, it means another year of hard work under our belts, experience gained and hopefulness for another great bee year. Of course, the greatest blessing of all is the birth of our Savior, Jesus Christ. We give Christ all the glory for blessing us beyond our imagination. Sheri and Karee have been making lots of good food and some extra Holiday sweets that are impossible to resist. We had our family Christmas gathering at our home on December 20th, and we enjoyed entertaining 20! Our family continues to grow! This year we insulated our entire bee building, added on another build room and a paint room. We’ve really been enjoying working in a warmer environment with more room! We’ve decorated our home with a Christmas tree, lights and other decorations. For a tree stand I use a 3 gallon bucket, stand the tree in it and fill it with small rocks. It holds it really tight and then I fill the bucket full of water. My wife wraps the bucket with a special Christmas cloth. Because our youngest son is only two, we could not put our gifts under the tree, or little Christian would open them up when our backs were turned. He likes Thomas the Train toys, so he’s got a little Thomas the Train track around our Christmas tree. Battery powered and all, playing Jingle Bells as it goes by. There’s nothing like see Christmas reflected in the eyes of a child. Here’s our family all dressed up for Christmas doing our annual Christmas dance! LESSON 68: What Do Bees Do In The Winter? Home Of The Winter-Bee-Kinds! In previous lessons I’ve talked about how to prepare our hives for winter. Please review those previous lessons if you become nervous about your bees this winter. But before you become too anxious about your cold bees, let’s gain some comfort from understanding how bees overwinter. The bees prepare for winter long before we even think about it. In the early spring bees are working hard to store up honey for the long winter months. All spring, summer and fall the bees are making preparation for winter. Their stored honey is their only hope of making it through the winter. They only need 3 pounds of honey per month, provided there is no significant brood to feed. That’s why most hives are doing fine now, in December and January, because with little to no brood to feed, there is food in the hive. However, in January as the days begin to lengthen slightly, the queen begins to lay alittle more, thus requiring more food to feed the larvae. This increases week by week until most hives become stressed in February and March, unable to continue to feed themselves or the larvae and they perish from starvation. Therefore, candy boards to the rescue! I believe the reason most hives perish in late winter is because they were reserving limited stores of food and therefore reduced their brood rearing. This makes for a decreasing hive in number and a hive that will eventually die out or become so weak that even if it survives into spring, it will not make any surplus honey. When beekeepers complain of low honey production, their hives probably suffered from low nutrition in December and January when they needed it the most. Now is the perfect time to slap on some candy boards. Bees do not hibernate during the winter. Instead, we use the word “cluster” to describe what bees do all winter. They cluster together. When I first started keeping bees I remember someone explaining to me that the bees form a ball in the hive and cluster in a ball and stay warm. My first thought was wouldn’t the frames interrupt their ability to form a tight cluster? One year I removed some frames to see if the bees overwintered any better since they could actually form a ball without frames breaking up the cluster. Didn’t make any difference. Heat travels well through the combs and frames even plastic frames. Remember, the bees do not heat up their entire hive like we do our homes. Instead, they merely gain heat from their surrounding sisters. When the temperature outside dips to 50 and below the bees begin to form their cluster. The colder it becomes, the tighter the cluster. The cluster moves around more when the temperature reaches around 50 outside. At this temperature or higher, they may actually travel to a frame of honey that is around them and carry that honey back to the cluster to feed others. And at temperatures 50+ they will fly outside the hive to finally go to the bathroom (defecate). During the winter, the temperature in the center of the cluster is maintained around 80 degrees and warmer if there is brood. However, toward the outside of the cluster the temperature may barely be above freezing. Cold bees are pulled back into the warmer cluster by warmer sister bees. I believe my bees do better the more winter fly days they have per month. It seems to me they stay healthier if they can fly one or two days per winter month. But that sometimes never happens here in Central Illinois. In the cluster the bees stay warm by generating heat by flexing their muscles. To do this, it requires eating honey. The colder they are, the more they will need to eat. But the warmer it is, the more they eat because they’ll want to move around and even fly out. Therefore, we have no choice but to leave 60-80 pounds of honey in the hive for winter, or feed them candy boards or sugar water during the winter. By January and February the bees have made their way up into the top deep hive body. The image shows how we can rotate our two hive bodies in April. But, never rotate the hive bodies unless you are absolutely sure that the entire cluster is in the top deep. Never break up the cluster if they are in both the top and bottom deep. Some beekeepers rotate their boxes too early and put the cluster in the bottom deep away from the upper heat source as heat rises. A cold snap can produce a larger number of dead bees than is acceptable. In The summer of 2011 we introduced our Winter-Bee-Kind after several years of studying overwintering hives. We could barely keep up with production they were in such demand. We still make them right here at Long Lane Honey Bee Farms but we've expanded our production methods to keep up with demand. So many beekeepers told us that these were the only thing that got their hives through the winter. This year, it's time for the 2014 production year. We even mix the sugar and pollen and right here and pour the candy into the Winter-Bee-Kinds. WHAT IS A WINTER-BEE-KIND? It is a one piece candy board that provides food, ventilation, upper insulation and an upper exit/entrance to help bees remain healthier during the winter. Someone said it insulates, ventilates and feed-i-lates. With the built in upper vent, you don't have to worry about snow covering up your hive's lower entrance. The bees can still go in and out through the top vent spacing. We avoid shipping Winter-Bee-Kinds in hot weather and start shipping each September-March. You can place our Winter-Bee-Kinds on your hive anytime, even in the winter. 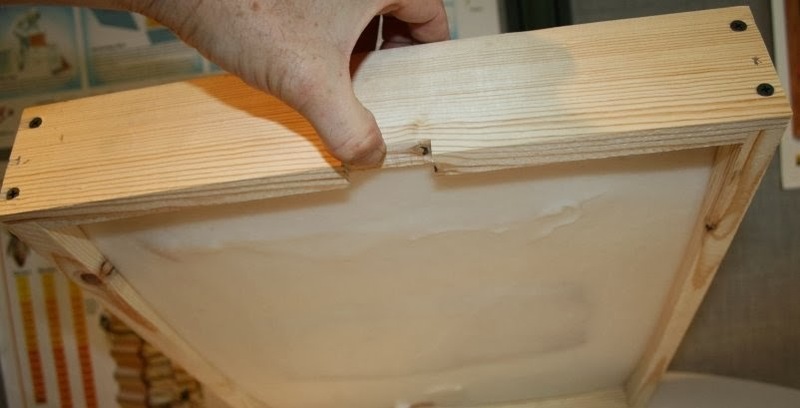 Because it goes on top of the hive in place of the inner cover, and you are NOT removing any frames, it can be placed on the hive in cold weather. Just do it fast. Open the top, remove the inner cover and place the candy side down and the vent slot toward the front of the hive and you're done. Click here to order your Winter-Bee-Kinds Some form of a candy board has been around for a long time. Beekeepers of long ago placed candy in their hives to provide enough food for their bees to survive the long months of winter. There are various mixtures and receipts for candy boards. Some are made with soft candy and some with hard candy. The end result is still the same. The bees will consume the sugar as they need it. We've always been concerned about the amount of condensation that can develop in the hive during the winter. The bees produce heat within their hive and as the temperature is very cold outside the hive, condensation will develop on the warm side, just above the bees on the inner cover or top cover. This condensation can accumulate and drop down onto the winter cluster of bees below. Bees can stay warm in the winter but they must remain dry. If this cold water drips down onto the bees, it can reduce their ability to keep their cluster warm. The insulation on our Winter-Bee-Kind helps reduce the excessive moisture and even puts some of that moisture to work, as it accumulates on the candy and makes it easy for the bees to consume the sugar. Thus, a Winter-Bee-Kind can help lessen two winter stresses, the lack of food and excessive moisture. We make our Winter-Bee-Kinds with sugar and a healthy amount of pollen powder. Many beekeepers make the mistake of only feeding their bees sugar in the winter, but the bees also need protein which they obtain from pollen. Our Winter-Bee-Kinds come with pollen mixed in with the sugar.. Click here to order your Winter-Bee-Kind today. We recommend that you place candy boards on your hive any time between Oct-March. Q: Which way does the candy face in the hive? A: The candy faces down just above the winter cluster. Normally, this means that the Winter-Bee-Kind would be placed on the brood box that contains the cluster. For example, if you overwinter your bees in a single deep hive body, the Winter-Bee-Kind would be placed on this deep hive body with the candy facing down toward the cluster. If you are using two deep hive bodies to overwinter, then the Winter-Bee-Kind would be placed on the top deep hive body. It is best to disregard the use of an inner cover, and simply place your top cover over the Winter-Bee-Kind. Q: What about winter moisture? A: Moisture can develop in the winter from condensation, a contrast of the heat the bees produce in the hive and the extreme cold temperature outside the hive. Condensation accumulates on the warm side, which means moistures collects on the inner cover or top cover above the hive. This can drip down on the bees and chill them during the winter. A Winter-Bee-Kind takes the place of an inner cover and any moisture that develops from condensation aids the bees in consuming the candy. Q: How long will a Winter-Bee-Kind last on a hive? A: On average about 3 weeks. However, a colony that has ample stored honey may not consume the candy board as fast or not at all until they need it. A colony close to starvation may consume a Winter-Bee-Kind within a week or two. Q: Since Winter-Bee-Kinds are placed or replaced on the hive in the winter, can I open the hive up on a cold day? A: It is best to place the candy boards on a hive when the temperature is above freezing and try to place the candy board on and have the hive sealed back up within 1-2 minutes. It should not take over 1 minute. Do not remove any frames in cold temperatures, only place your Winter-Bee-Kind on and off quickly. If you can choose the warmest day during the winter, that would be best. Try to avoid very cold, windy or rainy days. Q: How do I refill a candy board? A: It is best to send back your candy board and we will refill it for $7 plus shipping. If you are a good candy maker, you can do it yourself. Q: How do I get one with a pollen? A: Our Winter-Bee-Kinds contain pollen as well. Q: Can I make my own? A: You can, but you must experiment, because you do not want the candy to be too hard or too runny. The exact mix depends on your altitude, heat source and other conditions so it will be different from one location to another. Q: Why was some liquid sugar dripping out of my Winter-Bee-Kind when I received it? A: It is the nature of candy boards to be a bit on the dripping side even though the top may be hard. Do not be concerned if you see liquid sugar dripping out of your boards when you receive it. It usually means it was left on end during shipment for a prolong period of time. The bees will clean everything up and enjoy this soft liquid. Q: How much sugar is in one Winter-Bee-Kind? Q: When do I put a Winter-Bee-Kind on my hive? A: Any time! Nov, Dec, Jan, Feb are good months to place on the boards. Q How often should I check my Winter-Bee-Kind? A: Every three weeks, take a peek. Q: Do you make Winter-Bee-Kind for 5 frame nucs or 8 frame hives? A: Yes, check out our website to order, but carefully read the description to make sure you are ordering the correct size and type. Q: Can the candy break loose from the board on the hive? A: It rarely happens, but during extreme winter weather, the candy and separate from the board while on the hive. This is not a problem. The bees will continue to consume the sugar. Q: When I place it on the hive, do I use my inner cover. Just how does it go on? A: Winter-Bee-Kind takes the place of your inner cover. Simply place the Winter-Bee-Kind on the top of your upper hive body or super with the candy facing down, then place your top cover on top of the Winter-Bee-Kind. Be sure to use a rock or brick to make sure the wind does not blow your top cover off. There is overwhelming enthusiasm about our Winter-Bee-Kinds. Click here to order now. It has been a pleasure being with you today, and from Sheri and David Burns, we do wish you a Merry Christmas and a very Happy New Year. Hi, i am a brand new beek here in Australia. I have been reading everything you have so kindly written on your blog. I have a question about candy boards and other feeds. Why substitute for honey for the bees during winter? Wouldnt it be easier, cheaper and better for the bees to leave a couple of extra frames of honey and simply reduce the take overall for the benefit of the colony? I guess this assumes that a few frames of honey would negate the need for additional feed over winter? I love reading your blog and will follow it keenly. I did my candy following David's steps and it came out great. For my candy board ( 1 inch lip all around ) 5lbs of sugar is just enough to fill it to the edge. SCMBazaar offers value added shipping services to over 200 destinations in india through its extensive shipping companies.